We handle products to scrub and recoat wood floors. we contract to prepare and recoat the floors for them. re-coat the floor in five hours, and it is ready to use in 24 hrs. New System started as a BSC and we know how to help. time, help you be competitive in seeking new business. For businesses, an unpleasant restroom experience creates negative perceptions. 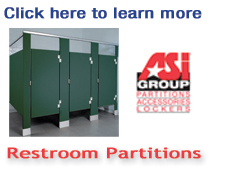 An unpleasant restroom can also translate into lost sales. We can eliminate Restroom Complaints. 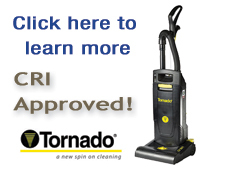 Prolink products and programs reflect the latest in commercial cleaning success. 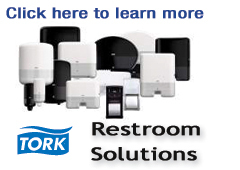 Pro-Link's products represent our newest solutions for commercial cleaning needs. 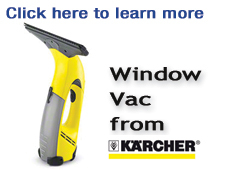 These products can help clean better and faster, increasing productivity and lowering overall cleaning costs. 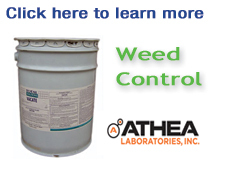 Many of our featured products are a good addition to a green cleaning program. 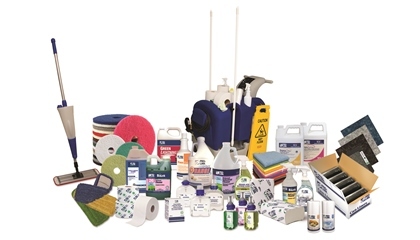 For more than 40 years, New System has helped clients’ bottom line and facilities shine by providing the absolute best in janitorial and maintenance supply products. New System understands the challenges faced by building service contractors – the need for training and improved labor productivity, increasing pressure on margins and the challenges of retaining customers – just to name a few. New System will not only help grow your business, but grow it more profitably. Here is just a sample of what we have to offer BSCs. Click on the links below to find out more about each area. 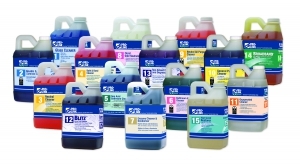 New System provides a complete range of high quality and high performance products – everything a BSC needs to deliver better cleaning results, while improving labor productivity at the same time. 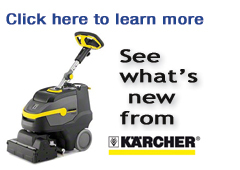 You can search for them here or download our latest product catalog. 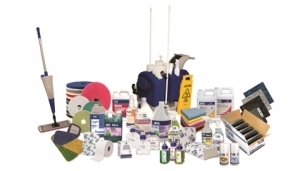 Here’s a few of our products that are perfect for the needs of building service contractors. Our Dilution Control Systems offer several different dilution control devices that all use the same chemical refills. So no matter what the requirements of the facility, you can have the same chemical refills – whether you use just one dilution system or multiple types. 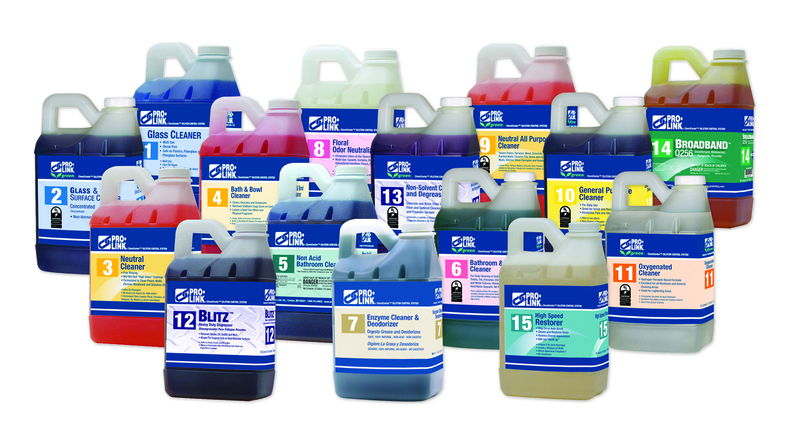 Each chemical refill is color and number coded to make training easy and minimize mistakes. With Pro-Link’s Microfiber System, you can clean better, increase productivity, increase worker safety, reduce chemical and water usage, reduce the risk of cross contamination, and lower your total costs. Pro-Link meets the challenge to help maintain clean and safe floors and work surfaces with a wide range of products to meet any facility’s needs: from flat mops with extended loops that pick up more than 10 times the soil of traditional mops and 4 to 6 times more than standard microfiber mops to disposable string mops, to clothes and gloves for dusting. Pro-Link’s Microfiber System utilizes innovative handles, holders, buckets and wringers to complement our microfiber solutions. These products are designed to reduce the risk of cross-contamination, keep your staff productive, reduce worker fatigue and strain, and minimize liability. New System’s Kaivac machines are designed for daily cleaning of restrooms, shower rooms, locker rooms and many other areas. This touchless, mobile system increases productivity by at least 30%! 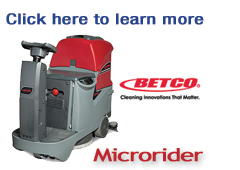 The unit is compact in size and allows you to clean even the smallest areas. 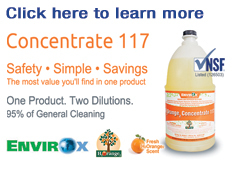 It helps reduce cross contamination and does a better job of cleaning compared to traditional methods. 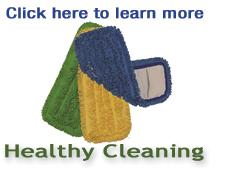 and a growing and profitable contract cleaning business! New System and Pro-Link have developed highly effective procedural training materials that help contractors achieve these results. 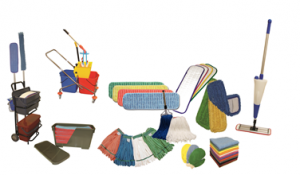 Our training materials cover the 10 most common cleaning tasks – from daily restroom cleaning to carpet spotting to hard floor care and everything in between. Our training is available in formats appropriate for group training and for placing in janitors’ closets to constantly remind workers of the proper procedures. And the material is available in both English and Spanish. Click on the links below to view samples of our training material. More and more, contract cleaners are being asked by their customers to “clean green”. 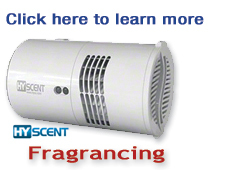 New System offers one of the most comprehensive Green Cleaning programs in the industry. We offer green-certified products, training tools, advice on how to start a green program, green cleaning certification education, and more. We have an ISSA Certified Expert (ICE) on staff to help you work toward CIMS certification. We are also a GCI certified education center to help your staff to get their industry certifications. New System and Pro-Link have developed a number of simple and easy-to-use spreadsheet tools to help contactors get their arms around the business. We’ve developed tools for budget management, inspections, quality control and labor scheduling. This spreadsheet help you track and manage your consumables spending for each account. Simply enter the budget and actual spending amounts each month, and spreadsheet does all the calculations for you — including easy to read graphs. Please contact New System for more information. To further help building service contractors improve their business operations and their long term profitability, Pro-Link publishes the BSC Advisor. It is written by a nationally recognized consultant to cleaning contractors and it focuses on business issues BSCs face and provides advice and suggestions. Click below for an example edition. Other editions of the BSC Advisor are available by contacting us. Growing a cleaning business is tough enough. Doing it profitably is even harder. 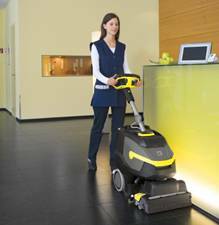 New System understands that many times the basic contract for daily cleaning services comes at very low margins. By adding on services beyond the basic contract, BSCs have the opportunity to enhance the profitability of the account. New System can help by providing contractors professional marketing tools to help win add-on business. For more information, and to have add on business tools customized for your company, contact us. All schools are being asked to do more with less staff. This poses many challenges. New System can assist you in analyzing your buildings with work loading software to be sure you are using your staff in the correct way. 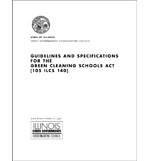 Illinois requires green cleaning in schools, and Missouri strongly recommends it. 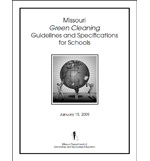 Both states have issued guidelines to help you build a green cleaning (healthy cleaning) program. 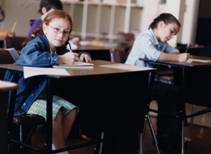 We have worked with many school districts with success. Three of our education customers have been recognized nationally by American School and University magazine for their green cleaning programs. Others have experienced better attendance records due to having healthier schools! If you would like to strive for healthier schools, let us help you. Don’t you expect teachers, school nurses, administrators, and even bus drivers, to have a recognized certification to do their jobs? What about the custodians who are responsible for the health and well-being of students, staff, administrators, and members of the community that enter our schools on a daily basis? Many school districts have recognized the benefits of having their staff certified in the best practices of healthy cleaning. New System is certified to teach these certification classes. We can do this on site, or in our training room at our headquarters in Earth City. Keep schools clean with a reduced staff is a challenge. One way to help get things done is by upgrading your equipment to accomplish more and better work in a shorter period of time. Your New System representative is happy to bring equipment to your facility to demonstrate how this is accomplished. How would you like to clean and sanitize 90% of all surfaces in your school with one concentrated product diluted two ways? Have we got the program for you! And, it is green too! Shiney floors and clean restrooms say a lot about how clean your school is. 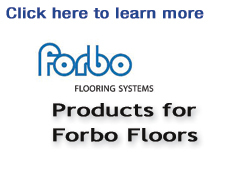 We offer new floor finishes with Nano technology, others with built in scuff resistance, pads for stripping you floors without chemicals, and much more. 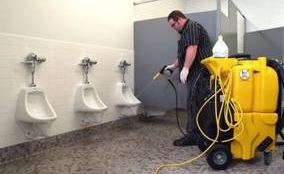 How about touchless restroom cleaning? We have the solution for that too. Physically remove the soil from the restroom along with the bacteria, and don’t touch anything! Ask us. Touch-free towel and tissue dispenser programs are available from New System. Manual push and touch-free soap dispensers too. Adding these programs to your clean restrooms elevates them to whole other level. Whether you use oil-modified finishes or water-based urethanes, we have the finish for you. 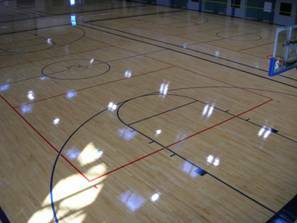 Gym finishes from Essential Industries are some of the most widely used in wood floor care. With Essential’s Sport Kote, two people can scrub and recoat your typical gym floor in five hours or less. That floor is ready to play on in 24 hours! Low odors, low VOC’s, high solids, make this finish the premium of the industry. It may also be burnished to restore the initial gloss.You don’t feel comfortable recoating your wood floors? Just call us. We have a staff that will take care of the labor and materials for you. As cleaning budgets and staff continue to be trimmed, many have found the only way to keep up is by adding equipment to make your cleaning faster and more efficient. 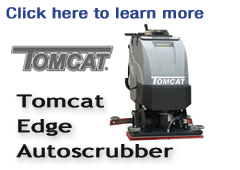 We carry several brands of equipment with a focus on applying the correct piece of equipment to the job at hand. Often we can find a unit that will allow you to accomplish several goals with one piece of equipment! It has been said that knowledge is knowing that a tomato is a fruit. Yes, head knowledge is one thing, but putting it to good practical use is wise and important. At New System, we want to impart knowledge regarding our industry to you and your staff. We enjoy sharing what we have learned, and sharing with our customers is important to us. You will notice the concept of knowledge, education, learning, training, and certification mentioned throughout our website. In the janitorial business, whether we are an in-house department, or an outside contractor, procedure is usually just as important as products and equipment. New System strives to provide an excellent lineup of products, a reliable choice of equipment, and the proper procedures to make them work for you. 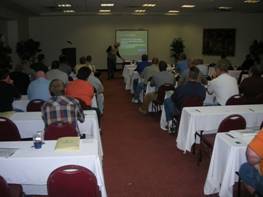 Check out our Training/Seminars page located under the Services menu for more information. Check back frequently to see our schedule of educational sessions, training seminars, and vendor shows at our Events page under the What’s New/Specials menu.